Online registration for this event has closed. Come to Norma Pfeiffer Park in Coburg on race day between 6:45 am - 7:45 am to register in person. All entry fees increase by $5 on race day. Cash, card and check are accepted. Special 2 For 1 Offer! Anybody pacing someone else MUST register for the event. Do not run/walk the race without registering. This includes people who only want to pace for part of the course and people who don't care about a finish time. Anyone participating in the event must register. There is a 4 hour time limit for the half marathon. 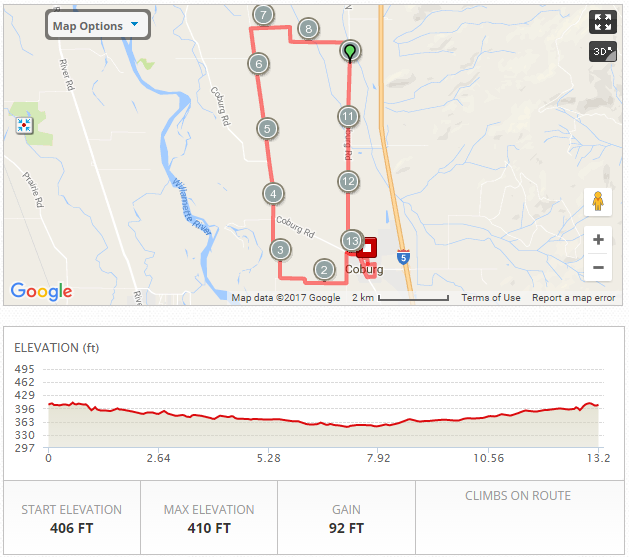 That is an average of 18:18 per mile. Parking is available at Norma Pfeiffer Park. Strollers and dogs are not allowed on the course. All of our events are chip timed by Eclectic Edge Racing. Results will be available at the red timing truck and online at www.EclecticEdgeRacing.com. You can also click on our results tab at the top of our website to see results. No refunds. No transfers. No deferrals. No exceptions. Once you have completed the registration process you will not receive a refund or a deferral to a future race if you cannot participate or decide not to come. Selling or giving away a bib number is strictly prohibited. Running under someone else's name and emergency contact information is strictly prohibited. There will be 4 aid stations on the course. They will have water, snacks and an energy replenishing beverage. There will be toilets on the course at miles 2.75, 5, 8 and 11. Long sleeve quarter zip logo embroidered shirts are available for purchase through June 13 for $22. We order just a few shirts extra in each size and they'll be available for purchase starting then. Extra shirts typically sell out quickly. After the pre-order shirt deadline, we are not able to reserve shirts - it is first come, first buy on race day. Extra shirts will not be printed after the event. Norma Pfeiffer Park is a short 22 minute drive from the Eugene Airport . The airport code is EUG and there are rental car companies at the airport. MAP OF AREA Check FlyEug.com for more information about the airport. We recommend Holiday Inn Eugene/Springfield at 919 Kruse Way, Springfield. It's a short 10 minute drive to the race site. 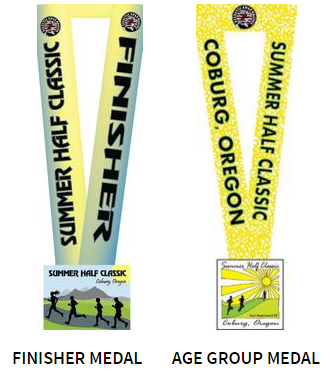 All participants that finish the half marathon will receive a finisher medal. Top 3 males and females overall and in each age group will be given medals at the results table near the finish line. Age group medals will be given out at this table during the event. There is no awards ceremony, we want you to enjoy the day and not have to wait for or hurry in for a ceremony. Any medals requested to be mailed after the event incur $5 shipping fee. When this page loaded, the official time was 7:57:38 AM EDT.